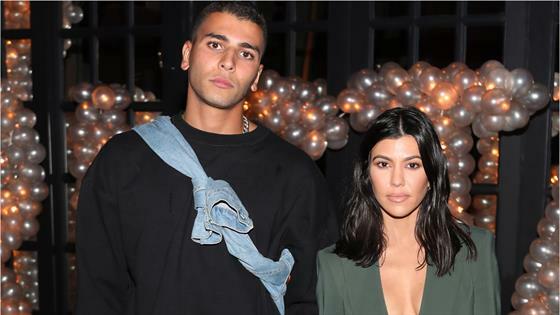 Kourtney Kardashian bumped into her ex, Younes Bendjima, over the weekend. The Keeping Up With the Kardashians star, who called it quits with her model beau in Aug. 2018, was photographed standing alongside her ex at Alfred Tea Room in Los Angeles. While fans of the former couple might be hoping for a romantic reunion, E! News has learned this was a chance encounter, not a planned meeting. "Kourtney bumped into Younes getting coffee at Alfred. It wasn't a planned meet up," a source tells E! News. "She goes there often and so does he. She was happy to see him and very nice. It wasn't awkward for her and they chatted for a few minutes." The insider adds that Younes bought Kourtney a latte because he was ahead of her in line. "It was sweet and she appreciated it. She gave him a hug and went on her way," the source shares. "He texts her from time to time but she has moved on. It was nice to see him and she was glad to see he's doing well." Kourtney and Younes' two-year romance came to an end over the summer after pictures surfaced of him getting cozy with another woman in Mexico. In late December, Younes took to Instagram to post a tribute to his ex as he reflected on the year. "Let's not forget this beautiful woman inside and out," Younes wrote alongside pictures of Kourtney. "I'm not the type of man that forgets moments like that. You [are] an amazing woman and mum and I hope you will find happiness for you and your childrens. It's all love at the end of the day...we don't know what can happen tmw so there you go." In response to the tribute post, a source told E! News, "Kourtney heard he had posted, but she has moved on from that time in her life. She doesn't trust Younes and his intentions. It felt like he was looking for attention and to be relevant again. She didn't think much of it. She's focused on other people and other things." Another insider added, "Kourtney is not in contact with Younes and hasn't been in a while. He would love for them to get back together but Kourtney has fully moved on. Kourtney thinks it's nice of him to post their memories as he was a huge part of her life for a while, but she is not phased. She knows he is still hurting and misses her, but she isn't focused on him."